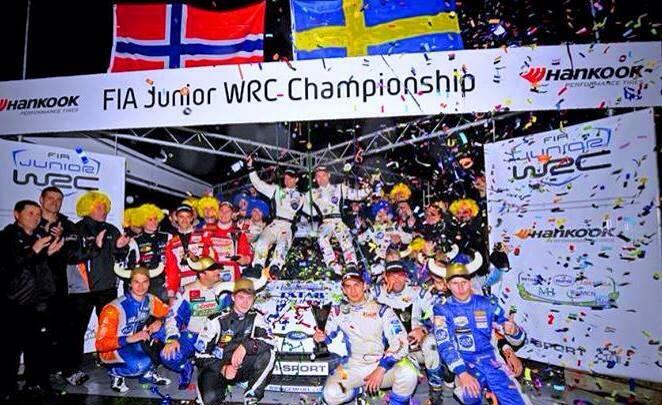 History was made in France this weekend as Sweden’s Pontus Tidemand and Ola Floene clinched the 2013 FIA Junior WRC title and becoming the first ever Junior World Rally Champion with the best sustainable race fuel; GEM Fuel! The 22-year-old was left clear to take victory after Canary Islander Yeray Lemes, who had an outside chance of the title, hit trouble while in front on Saturday’s final loop of stages. That followed problems for Tidemand’s other main championship rival, José Suárez, who rolled on Friday. Luxembourg’s Hugo Arellano grabbed an excellent second place on his Junior WRC debut, ahead of Norwegian Marius Aasen in third as nine of the ten competitors – all in Hankook-shod, GEM-fuelled Ford Fiestas R2s – made it to the finish line in Strasbourg. The Acropolis Rally of Greece saw the debut of GEM Fuel in the Junior WRC at the beginning of the season and after running all cars successfully over the next events, this weekend saw the crowning of a first ever ‘green’ world champion. The FIA and industry partners Abengoa, BioMCN, Eurol, Methanex and the Methanol Institute headed by GUTTS started the inspiring project of running the championship on the best sustainable racefuel available; GEM Fuel! With support and ‘can do’ attitude of JWRC Promotor Pure Sports, M-Sport, Vital Equipment and Impeco this historic fact marks a turning point in the world of rallying. We look forward to many more years of exemplary sustainable competition to come. Final and next round is the Rally of Spain on 23rd-26th of October.